I am a busy, busy girl. This is my last semester of college and I’m taking 7 classes while working a part-time job. With my crazy schedule, I’m rarely home during the day for lunch. I really don’t like peanut butter & jelly sandwiches. Generally I prefer to eat a hot lunch or something fresh and full of fruits and veggies. Unfortunately, it’s tough to do those things when you only have 15 minutes to eat something and no access to a refrigerator or microwave during the day. Thus, I’ve had to get a little bit creative. Last week I packed a lunch that not only hit the spot but left me craving more. How often can you really say that about a packed lunch!? 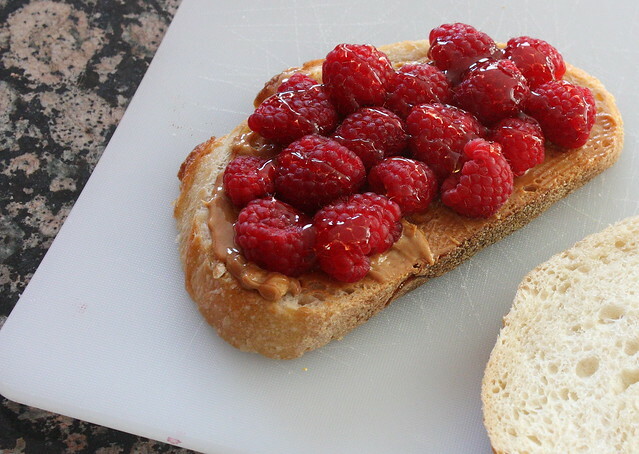 All you need is peanut butter, fresh raspberries, honey, and two slices of sourdough bread. The sweetness of the berries paired with the slight punch from the bread is perfection. Combine that with the saltiness of the peanut butter and the delicious honey and you’ve got yourself a ridiculously good sandwich. For a side I packed a blood orange and for dessert I ate a couple malted milk balls! Do any of you have to pack your lunches? What’s your favorite packed lunch? oh my this looks yum! I pack a lunch if i'm going to be out over lunch time, but it's all very boring looking at yours!